» Blog » Best Awning Company » Are You Interested in a Door Awning for Your Home? Are You Interested in a Door Awning for Your Home? A door awning from Sunesta can add style to your home as well as protect you from inclement weather while entering and exiting your residence. When you turn to Sunesta for your door canopy, you can expect a custom-made awning that will perfectly fit the precise dimensions of your entryway. The result is a sophisticated look that will add color and charm to the exterior of your home. In addition to adding to the aesthetics of your home and protecting you from the rain, a door awning will also help reduce heat gain. This means that your HVAC system won’t have to work so hard to keep the internal temperature of your home consistent, which can even lower your monthly energy costs. For a more dramatic upgrade to your home, we can also custom-manufacture window canopies that will perfectly complement the look of your new door canopy. This is a great option for homeowners who want to freshen up the look of their home without a costly and time-consuming renovation. 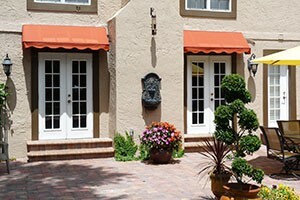 For more information about adding a door awning to your home, call 1-800-SUNESTA today. One of our friendly associates is available to answer any questions you have.